“Minimalism is as serious as it is really boring”, François Morellet loudly claims at the preview of his show Deep Dark Light Blue and Neons by Accident at Kamel Mennour. According to 83 year old French painter and light artist, who did minimalism before its time, there is a French paradox to which he belongs: a highly obsessive taste for meticulousness and precision that is coupled with total absurdity or nonsense. In other words, humor and derision are essential components in François Morellet’s system of objectivization. For an artist who has been classified among pre-minimalists, concretists or conceptualists but rather gladly defines himself as a “rigorous grinner” (“rigoureux rigolard”), irony, basic geometry and sometimes a bit of randomness help to distance oneself from intense and romantic display of subjectivity, as well as the solemnity that he despises. For the exhibition at Kamel Mennour, which happens to be his first in the gallery, François Morellet presents four offsprings of a new series of abstract geometric paintings combined with neon tubes, Deep Dark Light Blue (no. 3, 4, 5 and 6, all 2009). 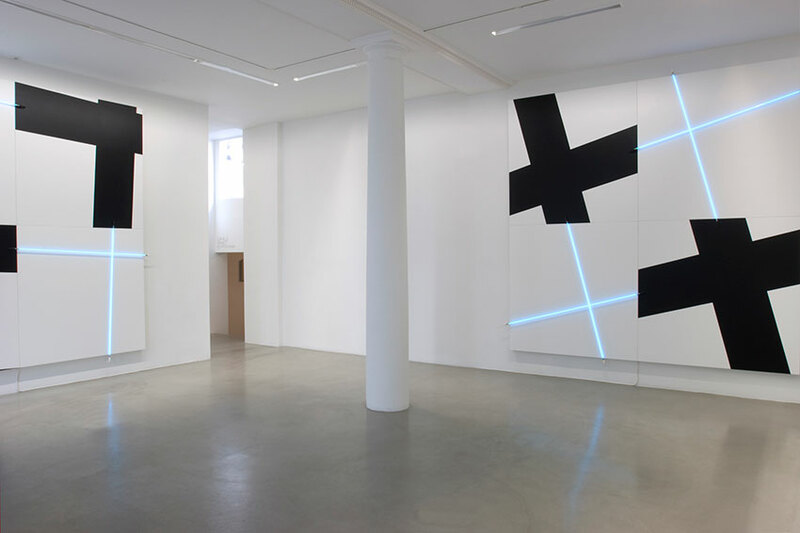 In each of these paintings light blue neon tubes are assembled on the canvasses so as to respond to and complete black and white elementary figures such as crosses and squares. All these combinations of light and painting give form to simple repetitive patterns that obey ‘predefined rules’ in Morellet’s words, basic geometric principles or constraints that the artist determines beforehand in order to strictly guide the creation and prevent all signs of subjectivity. The borders of the canvasses end each assembling game. Praising a logic that implies zero intervention, there is no need to precise that the artist doesn’t fabricate the pieces himself. In contrast with his simplistic but rigorously predetermined geometrical systems, François Morellet’s non-interventional logic makes use of randomness in the two earlier works that complete the show. The most recent one, Lamentable Bleu (2006, ‘pathetic blue’), is an abstract sculpture made with arcs of light blue neon tubes, which are joined in such a seemingly random way that they actually don’t recall any geometrically defined figure. Even though they could have been assembled in order to make a perfect circle, the neon tubes rather aimlessly and loosely hang from their heights to the ground where they vaguely spread out. We’re guessing that somehow this failure to complete a simple circle and the overall clumsiness for which the sculpture seems to stand are the reasons why the artist ironically qualified it as “pathetic”. The last piece, Neons by Accident (2003), seems to be literally the result of an unfortunate crash: red neon tubes scatter all over the floor and the walls of a room whose entrance is denied. Viewers can contemplate the accident through a window on the street side, as perhaps an actual collision would be too much to take.